In a few short weeks, Studio Be will have the great privilege of having Rebecca Leone in our midst, hosting our official Grand Opening on Thursday April 25th, and spending four days filling our studio with her amazing knowledge and wisdom. Haven’t had the pleasure of meeting Rebecca Leone? You soon will….and once you do, her name is one you will not quickly forget. Read on, for a wonderful look at Rebecca Leone, introduced to us by Laurette Ryan of www.balancepointpilates.com. Okay Pilates enthusiasts, have you met the Pilates Nun? Do you have one of her delightful pens? Or had the good fortune to attend one of her workshops? Yes?- you lucky dog! No?- well you must put her, on your list to do! The Pilates Nun (aka Rebecca Leone) and I sat down for a chat last month, well because I think it’s important that you know , “Who’s who” in Pilates and also because she is heading a worthy crusade to improve the quality of Pilates training, so that it is safe and effective…who couldn’t love that? Rebecca Leone was an extremely active youth. She describes herself as a tomboy, in love with outdoors,grit on her-bugs in her hair-married to nature kind of girl. She played competitive sports with the boys, loved swimming, diving, cycling, just about any kind of physical activity. She learned these activities mainly by watching, observing , somatic-ally digesting and processing. In her 20s she worked in the business world,developing systems and marketing her talents as a free-lancer …. being a free-lancer was great for her because it gave her time to pursue physical activities, try new things…(she is a bit of an adventurer at heart, an explorer) in the 1980s while looking for new and exciting challenges she found an article in the Portland Oregonian about Pilates. Mainly about the social history of Pilates, she found it so intriguing that she cut it out and put it in her things to do file. 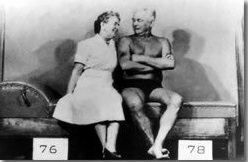 She could really identify with this Joe Pilates guy, so big and strong and athletic, a natural athletic ability she felt within herself. This may have been Rebecca’s love at first sight moment with Joe? She went on later to try find out about Pilates and at the time there was only one studio listed in Seattle… she gave them a call. They were a bit unaccommodating, not giving very much information, requiring her to come in for lessons to find out about their “secret society” (my words) Pilates. They were not nice and so she decided to forget Pilates. (let’s pause here – how helpful and educating is the staff who answers the phone at your studio? How many students are lost because of this kind of Pilates elitist nonsense?) So some time goes by and Rebecca , who’s been in 3 car accidents and feeling a little stiff, is urged by a co-worker to go to her (the co-worker’s) Pilates studio. She’s reluctant because of the encounter with the 1st Pilates studio, but she goes. She of course, loves it! (you knew that would happen!) One more thing, Rebecca is also diagnosed with histoplasmosis of the eye, at this time she is looking for a new career path…. isn’t kismet, somethin’? So here we have one active, athletic,smart, business savvy lady, who feels a cosmic connection to Joe and she’s is looking for a new and meaningful career, I love when the stars align, don’t you? Rebecca sought out schools to become trained in Pilates. Her foundational training was with Romana Kryzanowska , she truly enjoyed her training. However she did notice there was something missing. Her training had taught her hundreds of exercises,their order and transitions and how to set-up each piece of apparatus but there was no problem solving….What about the clients who had difficulty lifting their head and shoulders comfortably, what about strengthening and stretching the back for clients who could not make progress? Rebecca started developing protocols for problem solving then and there. Her idea was that she fully intended to open her own studio and wanted to help people overcome these barriers so there would be success for her clients and her studio. She wanted her clients to know upfront what she and Pilates were all about and what it could do for them…she didn’t want them to feel as she had, that Pilates was some mysterious secret society…..come take a lesson , sign-up and then we let you in on it. Rebecca graduated her training in July 2001 and opened her studio September 2001! If you know her this will not surprise you – she’s a get-it-done kinda gal. And that brings me to Rebecca Leone’s new mission….. Her mission: She says she was taught wrong and she has taught wrong , and there’s video! She goes on to assert we’ve all taught wrong based on bad information…we are all sisters and brothers in that. Like many of us, her required reading in training was Anatomy of Movement. Blandine Calais-Germain… and so she read it-really read it! She also found the work of Stuart McGill and his book “Low Back Disorders” which she says became “bible” for her. What she realized is, that the way she had been taught to teach flexion had a big problem, so she applied what Blandine writes about flexion of the spine to the teaching of Pilates (4-5 years ago). Suddenly, the understanding of how much stronger you need to be to do it the way described in these writings-led her to understand Joe more. When Joe wrote about lengthening… “he puts dashes between the letters of the words, in order to let you know how much he really, really meant for you to do just that”, says Rebecca. She began teaching workshops on this concept of resisted or lifted flexion. The deep back muscles get, as she says “ridiculously strong,” and as far as Joe was concerned – your spine was what, it was all about! After a few years of refining her Safe Spine Teaching Technique she wanted to share this information globally. Rebecca has taken this invaluable information which she acknowledges is right there for anyone to access and shows how to apply this to the Pilates work, for many a teacher has read these books and still hasn’t understood their implication in our field. Rebecca has identified 3 funnels for getting this information out in the public domain. First is the PMA Exam, secondly Teacher Training Schools (who are already getting on board – Balancepoint has stressed lifted flexion since 2007) and lastly, online and print media. (which are unfortunately full of examples of poorly executed exercises) She recognizes the fact that although equipment maintenance and good record keeping are important safety measures, if 86 percent of the Pilates repertoire is flexion and you teach it improperly that is the bigger safety problem. Rebecca admitted that “She is the messenger and she might get killed, but that’s alright”, her passion for this work, for Joe , for the history seems to be what drives her to help us evolve our understanding and firm-up our foundations so this work will go on. 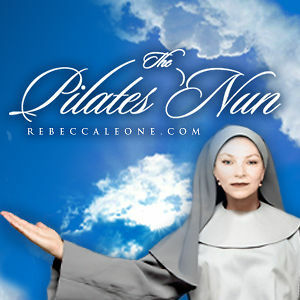 I asked Rebecca about “The Pilates Nun” where did that come from? , she explained to me that one day a client came in and said “how was your weekend?” she had to say “Was it the weekend ?… you see I am in constant service and devotion to Joe Pilates” and so she named herself the Pilates Nun – in service, devotion and sometimes long periods of celibacy. People sometimes say she works too much and her response is, “ that that person has not found the passion in their lives and that they are not driven with this ambition to share what they have with as many people as possible. And that is what drives me”….”the information is there, and I don’t think it should be held hostage for money”, she feels her mission is to help finish Joe’s mission to have the information be available. She cites that Joe qualified people, you had to be willing to take 3 sessions per week for 90 days in order to work with him-non-negotiable, she says if it took Joe 3 months to get the work into your body, we might be all be “screwed” because how will we get clients to commit to that? So she wanted to come up with ways for modern teachers to still “deliver the goods” without requiring the thing (coming to the studio 3 times a week for 3 months) that we can’t get today…so she teaches – at the first contact, (phone, email, etc.) get the client to understand two things :1.What I can do for you… and 2. That every session that I teach you will support the goal of you getting out bed every day of your life and your back feeling fantastic or as fantastic as it’s possible to feel. One of her great accomplishments is being one of the first to come to PMA to teach business strategies, to teach teachers the imperative business skills needed to be successful at running a Pilates business. She credits her previous life in that field of business and marketing with giving her skills she is able to pass along to others, these are skills most often missing from primary training programs which merely teach exercises. Rebecca stresses that part of what schools should be doing is preparing teachers to go out in the market and be successful. Our Pilates Nun is a one of a kind Pilates treasure. She freely gives away so much to our community, just go to her vimeo channel and check out all the free content on safe spine teaching and other teaching strategies. Better yet, book yourself into one of her workshops , you will be inspired, motivated, renewed and rejoicing! For more information on Rebecca’s visit to Studio Be, call 703 222 0122, or stop by the studio any time. When are your rebecca leone workshops and what are the cost? Workshops and costs to be posted by the end of the week. Stay tuned…. my followers! Great blog and outstanding design and style.